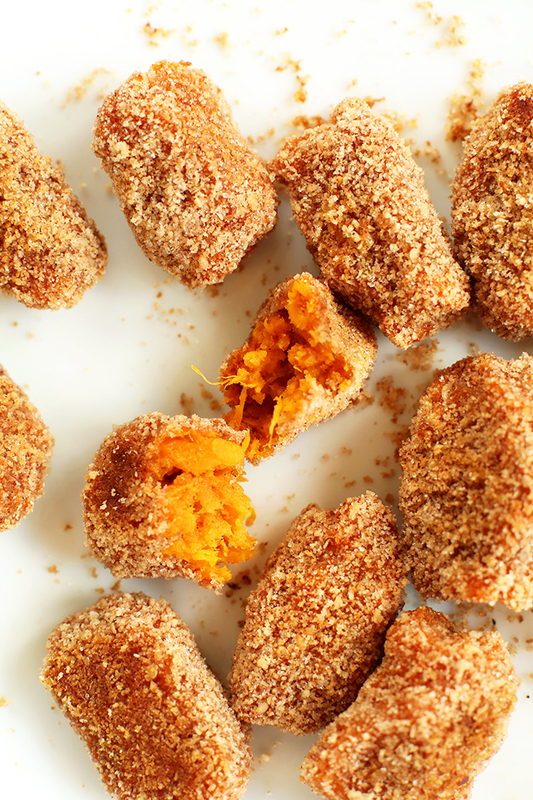 If you love sweet potato fries, you will LOVE these easy baked sweet potato tater tots. Or as I like to call them, Sweet Potater Tots. (Insert: laughing crying emoticons.) Plus, 7 ingredients – huzzah! So I’ve tried to make sweet potato tater tots before and it didn’t work out. They either weren’t flavorful enough or the texture was off. And I wasn’t about to fry them, so back to the drawing board I went. This time, success! The secret here is the panko bread crumbs, which I seasoned namely with salt, sugar and cinnamon. 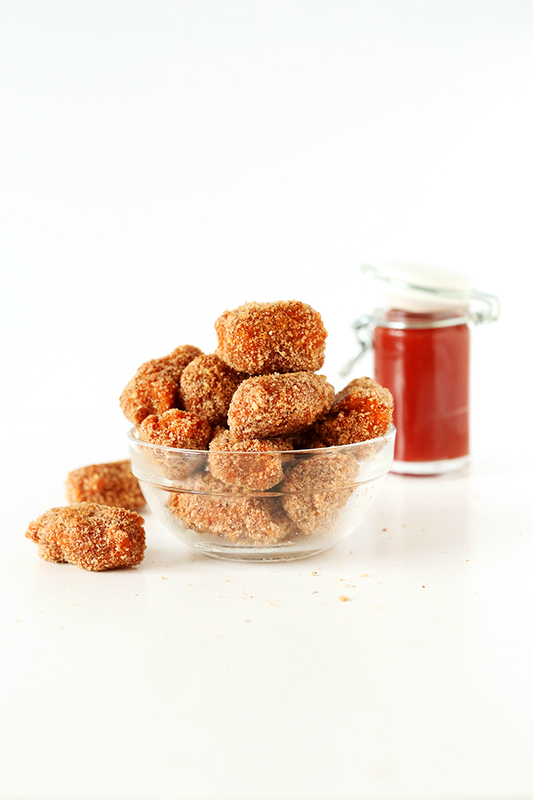 It gives the tots a crispy outer crust with tons of flavor. The next essential step is baking them until they’re golden brown and slightly crisp. The longer you bake, the crispier they’ll get. It’s magic. You could make these to serve alongside sandwiches or veggie burgers, breakfasty things, brunch, or on their own with other snacky appetizers like these vegan jalapeno poppers or cotija corn dip! They’re perfectly poppable and sweet and I kind love them. Hope you will, too. Cheers! 7-ingredient baked sweet potato tater tots tossed in a cinnamon panko coating that gives them a crisp outer crust. 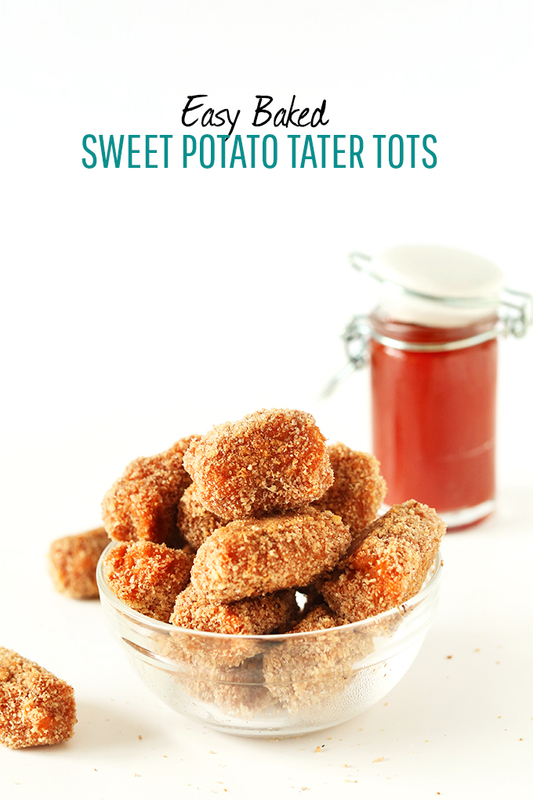 If you like sweet potato fries you will LOVE these tots! Poke holes in the sweet potatoes with a fork and bake in a 400-degree F (204 C) oven for 45 minutes – 1 hour until softened, OR in the microwave for about 5-6 minutes. Let cool to touch. While sweet potatoes are cooking, prepare coating. Add all ingredients EXCEPT butter to a food processor and blend until incorporated. While mixing, stream in butter. Dip your finger in to give it a taste. If you prefer it more savory, add more salt. If you prefer it sweeter, add more sugar or cinnamon. Peel sweet potatoes and add to a mixing bowl. Add cinnamon and mash – you’re not looking for a puree, but rather a rough mash. 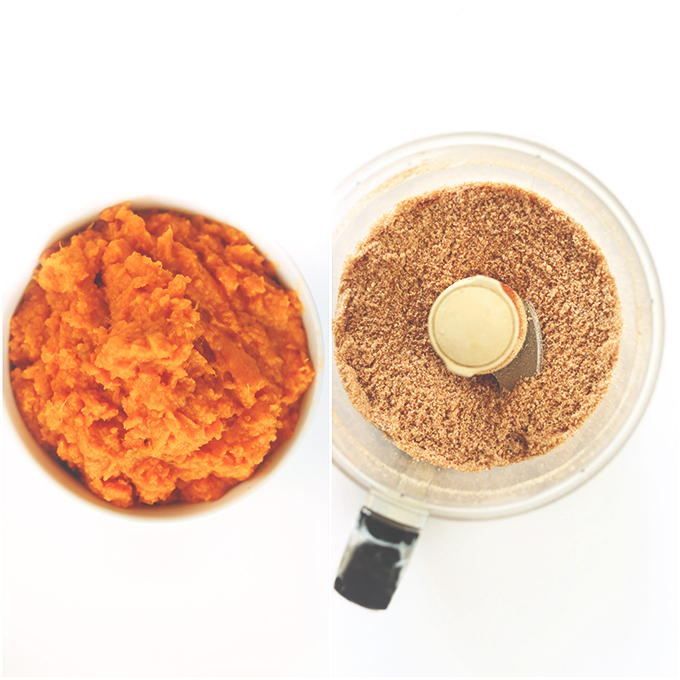 If your sweet potatoes are already pretty sweet on their own, omit the sugar. Otherwise, add it in and mix. Set in fridge to chill and preheat oven to 375 degrees F (190 C). Spray a baking sheet with nonstick spray. 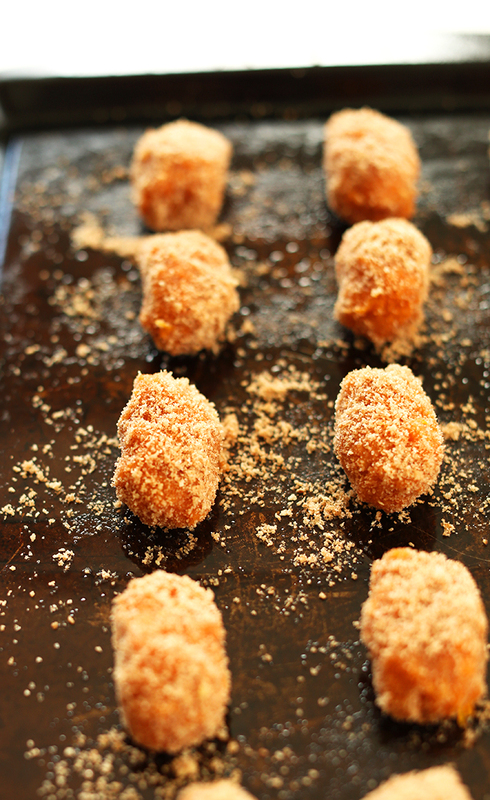 Scoop out scant 1 Tbsp amounts of sweet potato puree and form them into a “tot” shape – an oblong circle. Transfer to coating and use a spoon to gently toss to coat. Transfer to baking sheet and spritz the top with olive or canola oil to help them crisp up (optional). Bake for 20 minutes, then gently flip. Bake for 20 minutes more then serve immediately. If you want them firmer, just bake them an additional 10-15 minutes. The longer you cook them the crispier they’ll get! 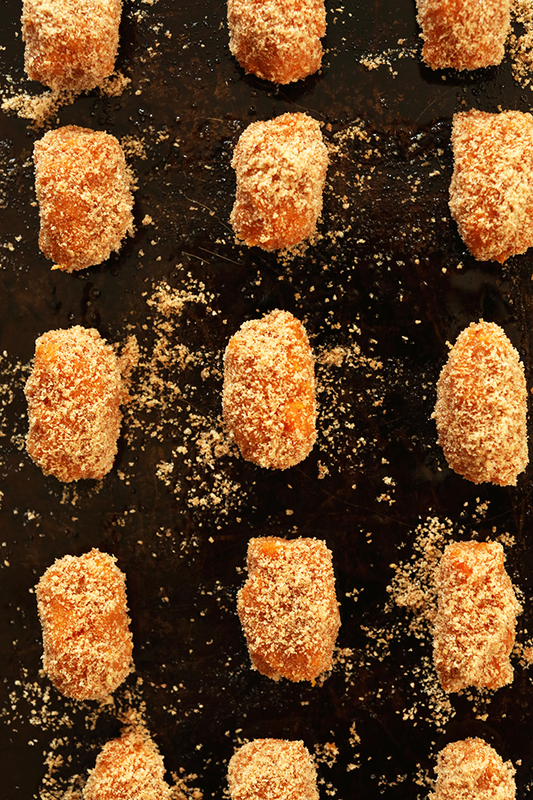 To freeze and bake later, form into tots, roll in coating, then transfer to baking sheet and freeze. Once thoroughly frozen, add to freezer-safe bag or container to store for later. When ready to bake, place on an oiled baking sheet and bake for 30 minutes, flip, then bake for 25-30 minutes more or until they reach the desired doneness. You really don’t need dip for these, but if you want, ketchup or a spicy aioli of some kind would be lovely. *Instead of panko, you could potentially sub something like almond or pecan meal, but I didn’t try it myself so I can’t vouch for it! I would assume it would be delicious, though. *If you wanted to get a savory/sweet flavor combo going, consider adding a pinch of cayenne or chili powder to the sweet potatoes and/or the coating. *Nutrition information is a rough estimate calculated with vegan butter. Will a nut butter work in place of the coconut oil? I’m not sure as we haven’t tried it, but if you experiment with the recipe, report back on how it goes. Good luck! Can you offer a savory tater tot option? I love your recipes!!! Hi my oven is broken. Do you think these will hold up in the deep fryer or pan fried? Hi LaVal! We haven’t tried it so we can’t say for sure, if you do let us know how it turns out! Hi! I have not tried freezing them after baking but if you do, let me know how it goes! The only thing I see that might change, is that they won’t be as crispy when frozen than defrosted. Good luck! Would these work with regular potatoes too? I think so, yes! Just don’t add the sweetener and make them more savory. These were great for my kids after school snack (and mine:-)). They don’t typically like sweet potatoes but these were a hit! 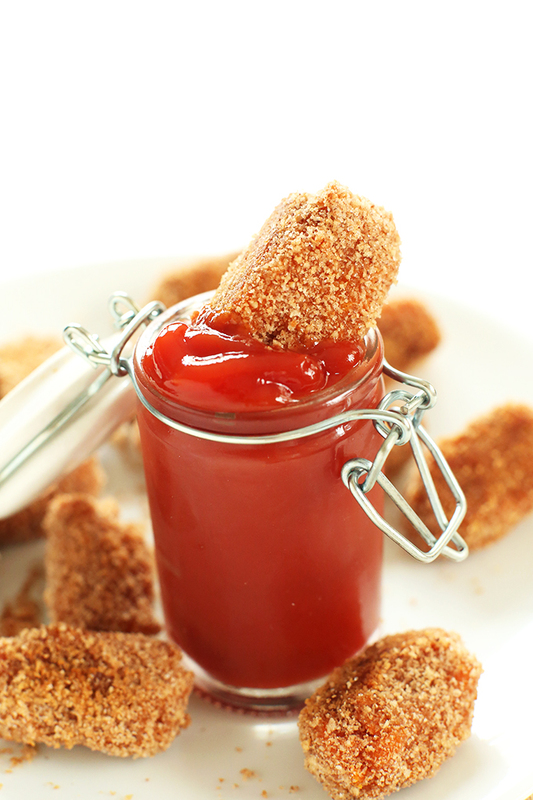 We dipped the tots into maple syrup instead of ketchup and it was a perfect pairing! Next time I’ll add a little more butter to the batter just to give the outside a crispier crust. Other than that – they are de-lish as is! 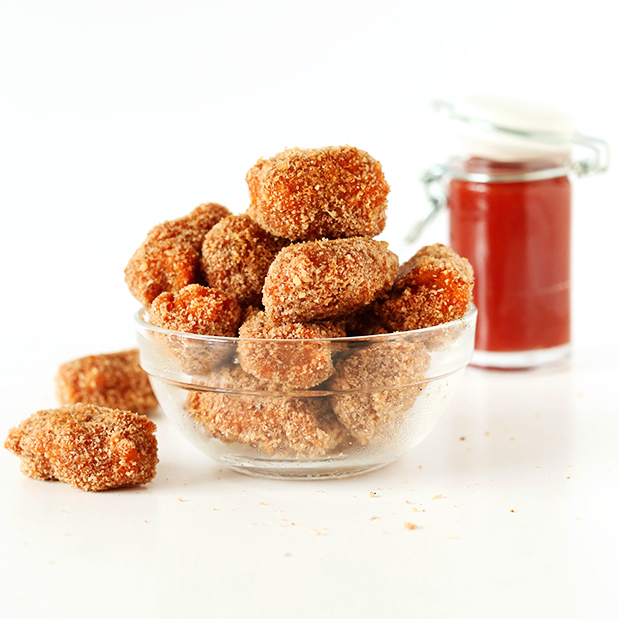 Fantastic sweet potato tater tots!!! Just made them and my family LOVED them!!! So crispy!! Thanks for a great recipe!! Yum. I need to work on my tot shapes, but our sweet potato balls were scrumptious! They were toddler approved too – which never happens the first time he’s offered something. Can’t wait to make them again. I’m looking forward to try this but I’m gluten free. Is there a substitute for panko and cornmeal ( I can eat corn, I just prefer to not buy it since I never use it)? Thanks! These are amazing! I just made them and they are so delicious. My son loved them too. Thanks for sharing this! Woah this blog is fantastic i love studying your articles. Keep up the great paintings! You understand, a lot of persons are searching round for this information, you could aid them greatly. I don’t have vegan butter or coconut oil, can I use traditional butter? Simple and delicious! I didn’t have bread crumbs so I crumbled up some bread and put it in the oven at 300 F for six minutes. It worked great! Thanks for the recipe! Lovely! Glad you enjoyed them!! Um, I seriously want all of these and I don’t really even like sweet potatoes. come ova and I make dem for you. made these for dinner tonight and they could not have been easier or more delicious. and my bf was super impressed i made them totally from scratch. thanks for the great recipe! yay! Glad you both enjoyed them – officially boyfriend approved!! These look so tasty. I am pinning for later. I can’t wait to try them. Oooh, fun fun fun. Love that you added cinnamon in there! mm, these are so tasty. Love this idea! I am always on the look out for new ways to serve sweet potatoes as they are a family favorite. This is the first time I have seen this. Dammit! I already started making cauliflower tots for dinner. Guess these will have to wait, for now. They look amazing! I just decided sweet potato was my new favorite thing to eat! It’s so yummy and wonderful and I’m so excited at the timing of this post! Thank you for your incredible work on this blog. I check it daily and am always looking for new recipes to try out. Yum!! I love sweet potatoes (kind of obsessed…) and these look so good for a snack, although I would probably en up eating them all haha! Yum!! I love sweet potato fries (and basically anything coated with panko bread crumbs), so I’m sure this will be a new favorite of mine. Thanks for sharing the recipe! These look fantastic. Sweet potato fries is one of my most favorite things. I love that you sneaked in a little sugar and cinnamon. Yes! It really enhances the goodness that sweet potatoes already have going on. Hope you enjoy these, Emily! P.S: I was wondering if you have a certain brand of panko you like to use? Thanks. Not sure what the brand is, sorry! I used them all up! These look stunning! I wibder if they would freeze well? That way I could have a healthier tot for my girls! Thank you! Great recipe! Definitely going to give this a try. 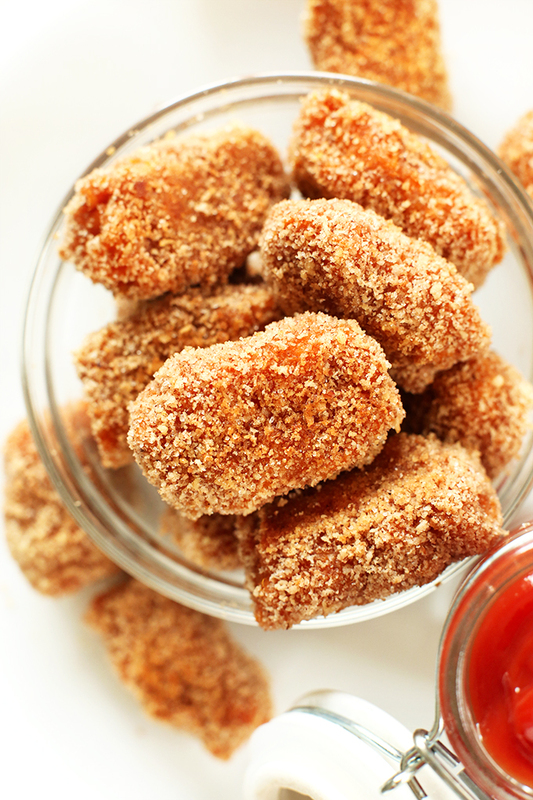 Who doesn’t love a tater tot?! Haven’t had one in years, but this post is bringing me back! I love that you used sweet potatoes. “It’s magic!” Please tell this magic to appear straight on my dinner plate! I love easy bake versions of almost any food, but I tasted tater tots for the first time in years recently and have been craving them ever since–though sweet potatoes are such a brilliant idea. I love it, Dana! This looks so, so good! I’m definitely going to try the recipe! It will be something entirely new for me and I can’t wait to find out how it tastes.